The Palmwoods to Buderim tramway (1914-35), through the transport and communication facilities it provided, played a central role in the development of the region, and as such is important in demonstrating the pattern of Queensland's history. The tramway was a specific response to the economic and social pressures encountered by Australian settlers at a particular phase of the twentieth century. The influence of World War I and the following economic depression on the establishment, operation and closure of the tramway is also of historical significance. The tramway was funded by the Maroochy Shire Council, partly through additional levying of local ratepayers, and remained under the control of the council for the entire period of its operation. Criterion BThe place demonstrates rare, uncommon or endangered aspects of Queensland’s cultural heritage. The tramway foundation and framework remnants demonstrates an uncommon aspect of Queensland's cultural heritage as evidence of a tramway with a gauge of two feet, six inches, and being of ‘private' (local government) construction. The environment through which the tramway route traverses is of considerable visual appeal, particularly in the steeper hilly section, lending the place aesthetic significance. The appeal of the environment is complemented by the technological grandeur of the construction modifications to the landscape, especially as they were achieved in a horse-powered era. There remains a pleasing unity in the track remnants. The place has a special association with the local communities serviced by the tramway for social and cultural reasons. The tramway, as the transportation hub for the region, facilitated community participation in sporting and cultural events, and provided a connection to Nambour and Brisbane. The Palmwoods to Buderim tramway track began operations in December 1914 and provided the impetus for substantial settlement expansion and economic growth in the Buderim area. It was constructed as a 'private' tramway, and continued to operate until August 1935. The length of the line was seven miles, fifteen chains (11.5km), which ran from the Queensland Government Railway Station at Palmwoods, across undulating country to Forest Glen on the Bruce Highway, and then climbed to the top of Buderim 'Mountain'. The first inhabitants of the Maroochy District were the Aboriginal peoples of the Nalbo, Kabi Kabi, Dallambara and Undanbi groups. Europeans first penetrated the Maroochy District in the 1820s. One of the significant figures in the early exploration of timber in South East Queensland was Andrew Petrie. Petrie explored the Maroochy area from 1838 and collected specimens of the bunya pine (araucaria bidwillii). The importance of the bunyas to the local Aboriginal peoples was recorded by early Europeans and Governor Gipps was persuaded to proclaim a reserve on 14 April 1842 which prohibited settlement or the granting of timber or grazing licences on land on which the bunya tree grew. While it was purportedly enacted to protect sources of food for the local Aboriginal peoples, it is equally likely that the proclamation was a way of protecting valuable sources of timber from exploitation. In 1859, the Colony of Queensland was created, and the Unoccupied Crown Lands Occupation Act 1860 was one of the first Acts passed by Queensland Parliament. It repealed the Bunya Proclamation, and provided for squatters' and timbergetters' licences. The native forests remained a steady source of income during the 1870s and 1880s, but Maroochy settlers needed to be versatile to ensure their selections remained economically viable. Most grazed beef cattle and the Buderim settlers experimented with sugar. Sugar ‘was a major contributor to the economic development of Maroochy Shire'. It was first grown in the Maroochy area in 1865 and sugarcane was first crushed in the area at a small mill in Buderim in 1876. Sugar crops took years to mature, so a variety of crops were needed to provide the farmer with another, more immediate source of income. Other significant crops grown in the area were bananas, citrus orchards, pineapples and ginger. The 1880s saw closer attention given to the dairying potential of the Maroochy region. Initially dairy cattle were kept for domestic needs, but dairying would soon develop into an industry, particularly with the slump in the fruit industries between 1908 and World War I when a number of fruit growers turned their fields into pastures. ‘Between 1880 and 1915, Maroochy developed into Queensland's largest fruit growing area and an important centre of dairy farming'. Queensland's coastal areas north of Brisbane, and the hinterland, developed rapidly in the 1880s. Buderim, a settlement which developed to service the local farmers, was established by the late 1880s. Shipping of timber and farm and fruit produce from Buderim and surrounds was complicated by problems with the silting and bars of the Mooloolah and Maroochy rivers. There was great competition in the region, and between regions, for development investment, with the port of Maryborough to the north being a rival for vital road funds. In 1879, local government was established in the Maroochy area with the creation of 74 Divisional Boards, including Caboolture, which incorporated much of today's Maroochy Shire. In 1890, the Maroochy Divisional Board was established, formed from the southern section of the Widgee Divisional Board and the northern section of the Caboolture Divisional Board. Buderim was part of the Caboolture Divisional Board until 1898, when it joined the Maroochy Divisional Board. In 1903, the Maroochy Divisional Board became the Maroochy Shire Council. Government railway building began in Queensland in the 1860s and a Gympie to Maryborough link was opened in 1881. An extension from Brisbane through Palmwoods north to Yandina was completed in 1891. The line was neither coastal nor western, lying between Buderim, the Lower Maroochy River, and the Blackall Ranges. While this positioned desired transport from Buderim to the capital and its markets tantalisingly close, poor roads hindered access. The roads up the steep slopes to Buderim were difficult to negotiate, especially in wet weather. A tramline to ensure Buderim growers could get their goods to market had been proposed for years. Maroochy Shire Council established a committee in 1903 to consider the possibility of a tramway to Buderim. Differences arose between supporters of the Buderim/Palmwoods link, the Buderim/Woombye link, and those lobbying to join with the Moreton sugar mill tramway system near Diddillibah, causing negotiations to continue for some time. During this time, the Maroochy Council purchased tramway lines from the Moreton mill in 1910, and using a government tramways loan of £27 000, extended the line (2 feet gauge) from Nambour to Mapleton west. Finally, an Order in Council for the establishment of the Palmwoods/Buderim tramway was reported on 29 July 1911 in the "Queenslander". The Palmwoods to Buderim tramway was constructed across some technically difficult terrain as a narrow gauge railway of two feet, six inches (76.2cm). This differed to the three feet, six inches of Queensland Government Rail and two feet (61cm) of sugar mill trams. The tramway was also a private tramway so while owned by Council, the Maroochy Shire Council had applied for a government tramway loan and then the 130 ratepayers in the area benefiting from the tramway were levied additional rates to service and repay the loan. The project cost £34 000, of which £21 000 was raised by the loan. The repayment of the loan continued until 1971 when the total had amounted to £84,000. Throughout Queensland, various Shire Councils undertook the construction of tramways which often represented a significant capital investment for relatively small communities. The Palmwoods to Buderim Tramway is considered to be a ‘private' tramway as it was constructed by a local government, and not the Queensland Government. Examples of other tramways built by local governments include the Belmont Tramway, established in 1912 by the Belmont Shire Council, and the Aramac to Barcaldine Tramway, established in 1913 by the Aramac Shire Council. Like the Palmwoods to Buderim Tramway, the Aramac to Barcaldine line connected to the Queensland government rail network. The tramway began operations on 1 December 1914 and was officially opened by the Minister for Railways on 18 June 1915. The official party and many others travelled to Buderim on the tram for the ceremony in the School of Arts. With this steady means of transport the Buderim area boomed. The Nambour Chronicle of 16 August 1935 reported that 'fruit production increased enormously, land values rose to great heights and further land was taken up by settlers at high prices. The tram, to cope with the traffic, had frequently to make two trips a day. Timber and fruit products were loaded onto the tram at the Buderim Terminus Station. Goods could be taken to Palmwoods and then transferred to the main line for export or distribution. The tram became a central feature in the area it serviced. It assumed importance for all social facets of the community, as well as the primary economic purposes. Expectant mothers were driven to the Buderim Station by horse gig to travel by tram to Palmwoods and thence by train to Nambour, to await the birth in one of the maternity nursing homes, there being no hospitals in the region. Passengers from the Vise Road area would be driven in a gig to Telko Station to go to Palmwoods, either to visit Brisbane or Nambour, and then on return by the tram they would get off at Mons Station, to climb the slope and steps up to Mons Road and higher to the present Mons School Road. There was no direct road access to the Mons Station from Mons Road. Loveday records that Mons Station was '"a mere shed with no visible means of approach'. Other social uses for the tram included transport to sporting and recreation events, while throughout the depression days those who were drawing the 'dole' would travel by tram and then train to Woombye to collect their sustenance allowance. Patrons of the tramway included more than the local population. Passengers from Brisbane would travel to Palmwoods to meet the tram and then journey to Buderim. The tram consisted of approximately 13 wagons, one passenger coach and a guard/brake van, pulled behind a German Krauss or American Shay steam engine. The flat-top wagons had fruit cases placed down their centres along which planks of timber were arranged to form central seats. In this manner about 150 passengers could be carried each trip. and at times two trips per day were made. Visitors would stay in one of Buderim's guest or boarding houses, or travel down to the coast. The tramway began to lose money in the 1920s from reduced freight revenue through lower farm output and introduced competition from the new network of main road transport. Another reason for the decline of the tramway was the onset of World War I, which curtailed any planned extensions to economically rationalise the line. A Queensland Survey Office map of the Buderim tramway shows hand drawn lines indicating, perhaps, two alternative track extensions to Maroochydore. Such plans failed during the economic depression of the 1930s. In 1933, the tramway actually ceased to operate for a short period because repairs were needed on the engine operating at that time and there was no balance in the tram working account. The Depression possibly added to all other factors to seal the fate of the tramway. The final run of the Buderim tram occurred on 10 August 1935. The last duty of the Buderim tram was to assist in dismantling the railway by delivering the rails, which had been sold to the Moreton Sugar Mill Co., to Palmwoods. Only the rails and engines are recorded as being sold, but the bridges and most of the sleepers and buildings were also removed at the time or later. 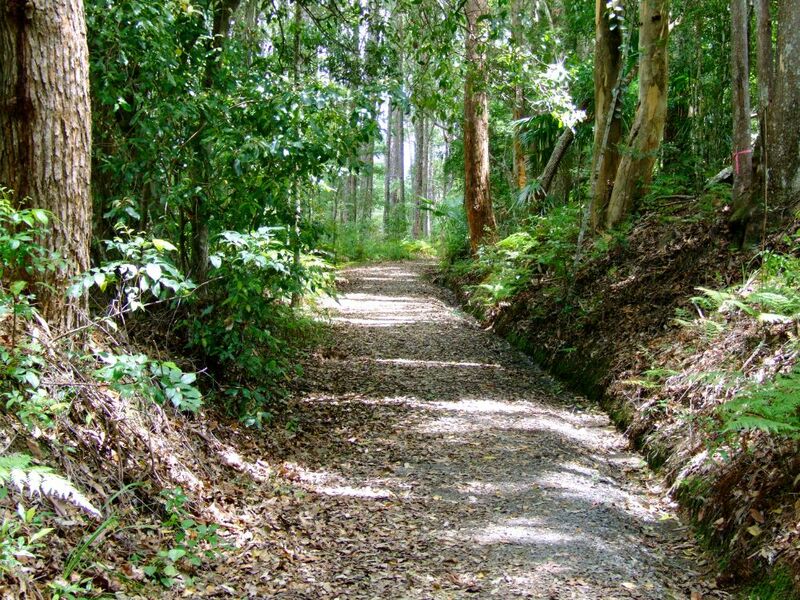 In 2014, the heritage listed portion of the original tramway route is a publically accessible walking track. Gregory, H. 1991. Making Maroochy: A History of the Land the People and the Shire. Boolarong: Brisbane, Queensland, p.1; Sunshine Coast Libraries. 2009. A short history of Maroochy (online). Accessed 29/08/2014 from: http://library.sunshinecoast.qld.gov.au/library/documents/heritage/a_short_history_of_maroochy.pdf. Gregory, H. 1991. Making Maroochy: A History of the Land the People and the Shire. Boolarong: Brisbane, Queensland, p.11; Sunshine Coast Libraries. 2009. A short history of Maroochy (online). Accessed 29/08/2014 from: http://library.sunshinecoast.qld.gov.au/library/documents/heritage/a_short_history_of_maroochy.pdf. Sunshine Coast Libraries. 2009. A short history of Maroochy (online). Accessed 29/08/2014 from: http://library.sunshinecoast.qld.gov.au/library/documents/heritage/a_short_history_of_maroochy.pdf; Powell, J. 1998. People and Trees: A thematic history of South East Queensland with particular reference to forested areas, 1823-1997. Queensland: Queensland CRA/RFA Steering Committee, pp.8-9. Gregory, H. 1991. Making Maroochy: A History of the Land the People and the Shire. Boolarong: Brisbane, Queensland, p.5. Moreton Bay Courier, The. 1860. The Land Acts. The Moreton Bay Courier. 25 September 1860, p.3; Heap, E. "In the Wake of the Raftsmen: A survey of early settlement in the Maroochy District up to the Passing of Macalister's Act (1868). Queensland Heritage. Volume 1, Issue 3, p.5; Sunshine Coast Libraries. 2009. A short history of Maroochy (online). Accessed 29/08/2014 from: http://library.sunshinecoast.qld.gov.au/library/documents/heritage/a_short_history_of_maroochy.pdf; Sunshine Coast Council 2011. Maroochy Region (online). Accessed 29/08/2014 from: http://library.sunshinecoast.qld.gov.au/sitePage.cfm?code=maroochy-region. Gregory, H. 1991. Making Maroochy: A History of the Land the People and the Shire. Boolarong: Brisbane, Queensland, p.24. Sunshine Coast Council. 2012. Walk Buderim (online). Accessed 29/08/2014 from: http://www.sunshinecoast.qld.gov.au/addfiles/documents/heritage_culture/walk_buderim.pdf. Gregory, H. 1991. Making Maroochy: A History of the Land the People and the Shire. Boolarong: Brisbane, Queensland, pp.20, 24-25. Gregory, H. 1991. Making Maroochy: A History of the Land the People and the Shire. Boolarong: Brisbane, Queensland, pp.60-61. Sunshine Coast Libraries. 2009. A short history of Maroochy (online). Accessed 29/08/2014 from: http://library.sunshinecoast.qld.gov.au/library/documents/heritage/a_short_history_of_maroochy.pdf; Fraser, G. and N. McGarvie 2010. The Buderim - Palmwoods Tramway. Buderim - Palmwoods Tramway Incorporated. Buderim: Queensland, p.19. Gregory, H. 1991. Making Maroochy: A History of the Land the People and the Shire. Boolarong: Brisbane, Queensland, p.73. Old Cleveland Road Tramway Tracks QHR 601839. Smith, A. 1996. "The Aramac Tramway". Lectures on North Queensland History. No.5. Townsville: Department of History and Politics, James Cook University of North Queensland. 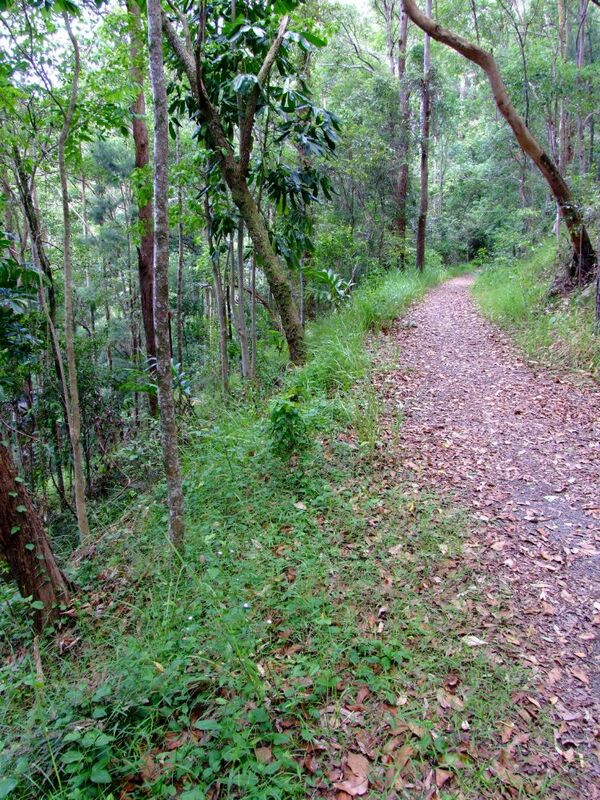 The heritage listed section of the Palmwoods to Buderim Tramway is a narrow, level track approximately 1.57km long, winding through undulating, heavily-forested terrain on the outskirts of Buderim. The route begins at Telco Road and travels generally west. The track includes considerable engineering in the form of sharp corners, substantial embankments and cuttings, as well as more subtle elements including remnants of explosives bores, timber sleepers and a cattle grid. Three tree stumps with evidence of historical felling techniques stand adjacent to the track. The tramway sits high in the terrain, which generally slopes from north down to southern gullies and the geology varies between solid sandstone to a softer stone towards the western extent of the tramway boundary. At certain points along the track, views can be seen to Tanawha and the ranges behind. The cuttings are double or single-sided and range in depth up to 9m, through earth, soft stone and solid sandstone. Approximately 770m from Telco Road is the most distinctive cutting; 48m long, 8-9m deep, double-sided and cut through solid sandstone. The track has four substantial earth embankments. Approximately 190m from Telco Road, the longest is 63m long, 20 to 30m in height, with sides steeper than 45 degrees. Small concrete culverts channel water transversely under the track. The track retains three sections of exposed timber sleepers. The first is located approximately 870m from Telco Road is the largest and most intact section of exposed sleepers at 14.2m long. The average distance between sleepers is 40cm. The most intact sleeper of this group is 43cm long x 20cm wide. The second section, located 910m from Telco Road contains only one exposed sleeper, 145cm long x 20cm wide. The final section of exposed sleepers is located approximately 960m from Telco Road and comprises four degraded sleepers across a distance of 230cm. Along the track are three stumps of felled trees with evidence of the springboard felling technique. The first is located approximately 380m from Telco Road and is visible from the track. Standing 6m north of and 6m above the track, the stump is 305cm tall and 270cm in circumference. It has two springboard notches: notch 1 - 154cm above ground, 13cm wide x 6.5-9cm high; notch 2 - 180cm above ground, 14cm wide x 6-8cm high. The stump is partially hollow. The second tree stump with springboard notches is located approximately 450m from Telco Road, standing 4m north of and 5m above the track. It is not an obvious fell and the springboard notches are not deep. The third tree stump is located approximately 770m from Telco Road, standing 5m north of and 5m above the track. There are springboard notches visible from the track but it is not an obvious fell. Approximately 1050m from Telco Road, and opposite the site of the former Mon's Station, are remnants of explosive bores drilled into the stone face of a cutting - evidence of the blasting technique to create the cutting. Two semi-circular bores are evident, 110cm-115cm long x 5.5cm wide. Approximately 1320m from Telco Road is a timber and earth feature, possibly a retaining wall or the remains of a timber bridge. Located on the north side of the track, it comprises a 245cm long timber member inset into the northern wall of an earth hollow. Approximately 1450m from Telco Road is the monogram 'VE' carved into the stone face of a cutting. The carving is 20cm high x 30cm wide. Approximately 1540m from Telco Road and near the western end of the track is remnants of a cattle grid, comprising timber members fixed into a grid by metal pins. The grid is 315cm x 270cm and individual timber members are 270cm x 27cm.